A lifelong Abbotsford resident, Ray Stewart has had an outstanding golfing career. 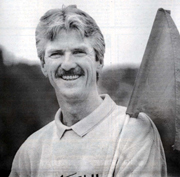 Stewart has been a member of Abbotsford’s Ledgeview Golf Club since 1969, where he refined his skills to the point that in 1980 he became an active player on the PGA Tour. Stewart played in over 200 PGA Tour events and made the cut in over half of them. His career earnings on the tour were in excess of $600,000 which was before the large paydays that now exist. In addition, although slowed by several nagging injuries, he as also played on the Champions Tour. One of Stewart’s many highlights during his golf career was winning the Dunhill Cup with the Canadian team in 1994. Stewart is still actively involved locally, helping coordinate the prestigious Ledgeview Open. He has also been instrumental in fundraising for the University of the Fraser Valley golf program where his son, Brett, was a team member for five years.